“That’s when it pays to live up there,” said the now thoroughly-domesticated Mrs. E. in reference to my mentioning that New York will celebrate Leonard Bernstein’s (pronounced like “Steinway” as my mother would invariably remind me) would-be ninetieth birthday by playing dozens of concerts. “That’s when it pays to have lived then,” was my thought. When we were little and shared a room, my brother, Alexander, and I used to drift off to sleep at right angles to each other, listening to the steady waves of laughter, piano playing and singing emanating from our parents and all their witty, noisy friends downstairs. This is what grownups did: they drank and smoked and interrupted one another and played raucous word games and sang at the top of their lungs and laughed until they choked. We couldn’t wait to be grown-ups. That pretty much sums it up doesn’t it? As a child, I was frequently enlisted to solicit drink orders and deliver the finished product to guests. My parents would drape a little white linen napkin over my arm and hand me a silver and melamine tray holding a martini to take to Group Captain Sinjin-Sinjin Smythe, RAF… . After having my dinner in the kitchen and saying my goodnights, I would be led upstairs to bed. More than once I would tiptoe to the top of the stairs and peer down to watch the shadows dance across the floor and hear the laughter and tinkling of ice in glasses. If it was late enough there would be someone playing the piano and a group chorus singing along (Australians love “Waltzing Matilda.”) “Do You Know the Way to San Josè” was popular that year. “What’s New Pussycat” was another crowd pleaser. Like Ms. Bernstein, I couldn’t wait to be a grown-up. Mrs. E. and I try to recreate the feeling of those parties. I wonder how well we succeed? No one wears coat and tie (well, regularly … we do specify dress sometimes) let alone a uniform. Women guests don’t jingle with bangles, leave the scent of “Chanel No. 5” lingering behind as they pass through the crowd, or abandon lipstick smudged Sobranie Cocktail Cigarettes in the silver and crystal ashtrays…. Those days seem to be gone. Piano lessons are on Mrs. E.’s list of “must-learn-to’s.” And, on occasion, I still use the tray to pass drinks. What are your fondest memories of the adult world downstairs? What are your secrets for (re)creating a grown-up party? Or is it even possible in today’s world? This entry was posted in Uncategorized and tagged Entertaining, Leonard Bernstein, Town & Country. Bookmark the permalink. Does anyone grow up anymore or do we simply age? I fear it’s more the later. I don’t know that we’ve got the hang of grown-up parties in the Luce house, but we generally try to make sure that we center our parties around adult proclivities, such as wine, and have some sophisticated music queued on the Ipod. Still, I think the world when my mom would wear Chanel No. 5 for a night on the town and I could eavesdrop on my aunt’s parties for the other college professors are long gone. Such a pity. At the risk of sounding like Celeste Holm in the TV musical “Cinderella,” it’s possible!!! Cold drinks, cool music, and people asked to dress festively usually does it, when it comes to the basics. People are always delighted to get an invitation for drinks—it’s a chance to mill and converse, to chat and meet new people, all without work pressures, without an agenda, without having to do anything other than look good and be pleasant, et cetera. What makes a drinks party grown-up isn’t the outfits or the perfumes but the spirit of the event. 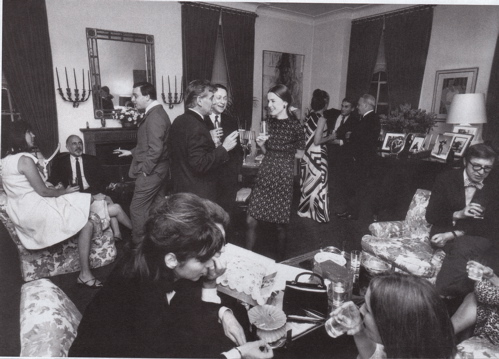 One of the best grown-up parties my spouse and I ever hosted was at our then-new apartment. It was a wonderful apartment, built around 1900, the architecture all Louis Seize in style, and though the furniture was pure flea-market and in need of upholstery, et cetera, we waxed the floors, filled vases with pink tulips, polished all the silver, put on a collection of Dinah Washington/Billie Holiday/et cetera CDs, put all the lamps on dimmers and scattered the rooms with Rigaud candles. We made masses of dip and had gallons of Champagne and rosé on ice. The last guest didn’t leave until 1am. The weather was vile (hot, humid, rainy), and though some guests came dressed in coat and tie and smart little shantung-silk shifts, others arrived (more sensibly) in linen and open-collared shirts. It felt uptown and downtown and little bohemian Auntie Mame-ish. And it was wonderful—and it was the first drinks party I ever hosted where even I felt grown up. My parents travelled a lot and when they’d get back after a month or three, they would have a huge party with the cuisine of where-ever they’d been. One of my earliest memories was of a paella & sangria party after they’d returned from Spain. The smells of the olive oil and seafood, the rice and the sweet sangria, mingled with Chanel No. 5 and cigarettes, all bring back that warm summer evening for me. We always lived in houses with landings between the first and second floors. I remember lying with my sisters watching from above and seeing how much fun my parents and their friends were having. We were taught early on to shake hands and curtsey and call their friends by Mr. and Mrs. It’s never too early to learn good manners. That’s a great post. I remember well going to sleep hearing Herb Albert and TJ Brass, Astrud Gilberto and Ahmad Jamal. Laughter from the adults and the wonderful drone of the night as it put me to sleep. I still think one can capture it. More easily done nowadays in a bar that plays Jazz and that can mix a dry martini. There’s something about martinis and the Bill Evans Trio that sends me back to 1966 and those parties of my parents. I just wish I knew what they did for their hangovers. At any rate, it is a lovely article and well worth the read. I think it’s a case that yes we don’t want to grow up but we also forgot how to dress for a cocktail party. But I do think that we’re starting to change — and as a culture we’ve started embrace beautiful fabrics and a quality tailor. It’s always great to have a reminder with posts like this that we need to bring more class into our lives. Yes, freshing the guest list is a good start. Who wants to think (as society dame Mamie Fish once said), “Younger clothes, older faces”? “refreshing” … Good Lord, my typos today are dreadful. Hello Porter, it helps to keep an elegant frame of mind, doesn’t it? I loved y’all’s Raj party! Bully for the guests who made the effort. I’ve got to confess that I fall down on the flower front without fail. These days it seems as if the shopping is so rushed that I inevitably forget something. Flowers are never a speedy last minute rush to the corner market find… I shall try to do better. Oh Aesthete, don’t worry I mentally filled in an “en.” Besides, “freshing” a guest list sounds sort of like plumping a pillow… a pleasing end result any way you look at it. My parents seemed so “uber-cool” to me and my sister. My dad was a bigwig in the ad world in the 60’s and 70’s (very Madman! ), and they seemed to be having a ball. Times didn’t seem so judgemental in a way and people drank, smoked and sometimes made out withh the neighbours wife! No one seemed to get too riled up about that. There was lots of piano playing and singing, and we have a picture of my mom and dad and their friends on beach chairs with ray bans, and cigarettes singing around a beach bonfire in the very early ’60s that just seems to sum everything up so well. I wonder what my children will think of us . Will be seem glamorous in any such way? Welcome Sally. That’s the question, isn’t it? There is still time to cultivate your own glamour and elegance. We’re the role models now.